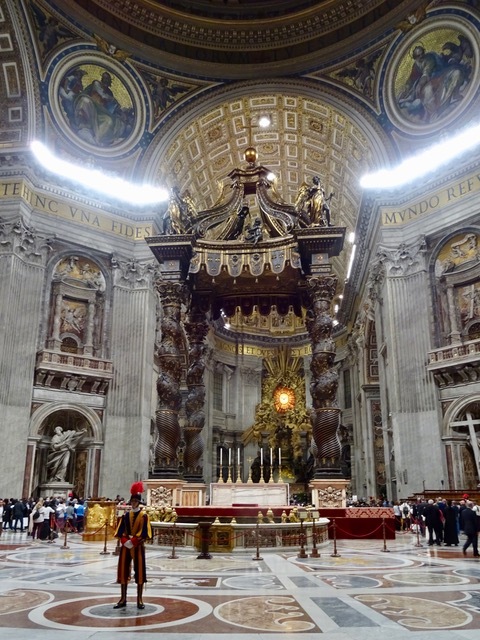 Bob read that the Pope was doing a special mass for peace in South Sudan and the Democratic Republic of Congo at 5:30. 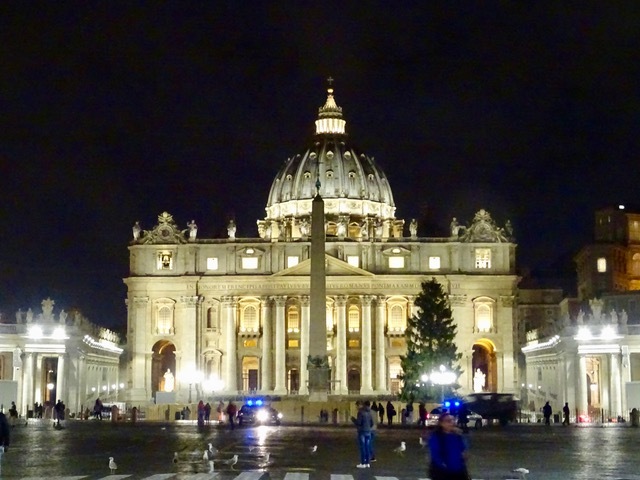 We decided we would go to St. Peter’s and see if we could get in. 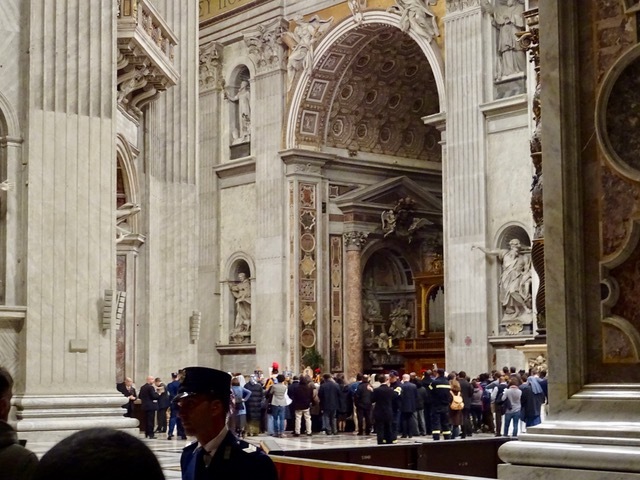 There wasn’t much of a line up to get through security and soon we are in the Basilica. 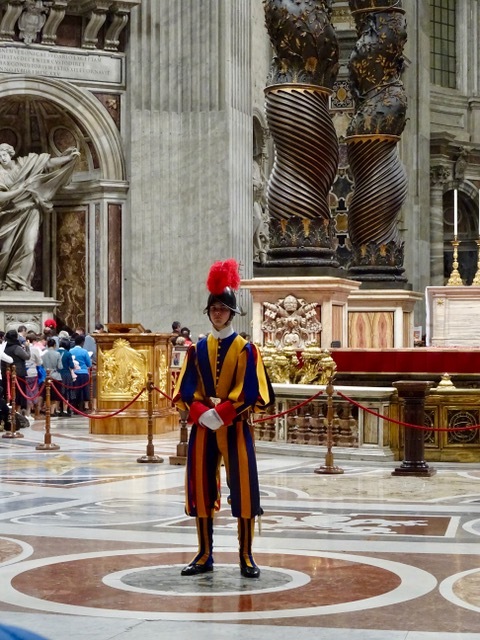 We make our way to the front of the crowd and take some photos of the altar, and the Swiss Guards who are responsible for the safety of the Pope. We had a little look around while waiting for something to happen at 5:30. 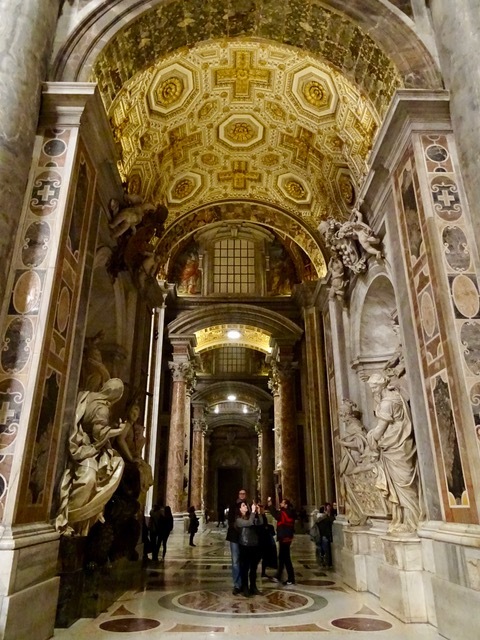 This is looking towards the front doors of the Basilica, with a view of yet another magnificent ceiling. We feel very small in this enormous cathedral . 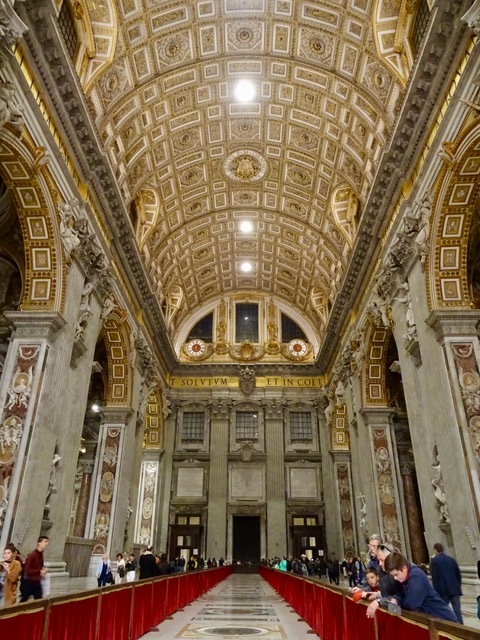 Everywhere we look there are statues and ornate gilded decorations. 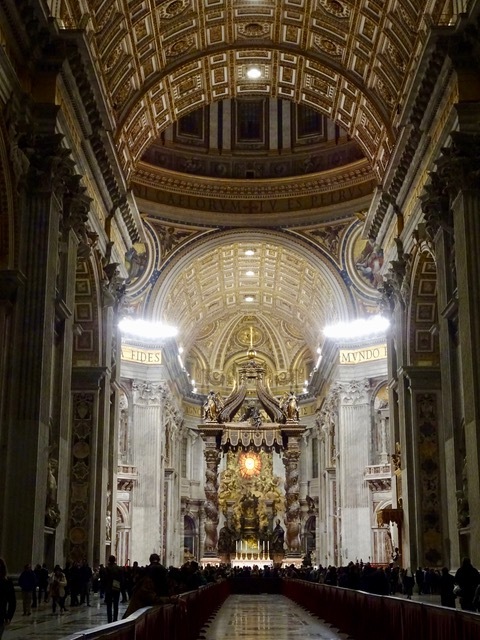 At 5:30 the mass starts but it is far from us, behind the main altar. There are guards keeping people back behind barriers, while only allowing a select few to enter. 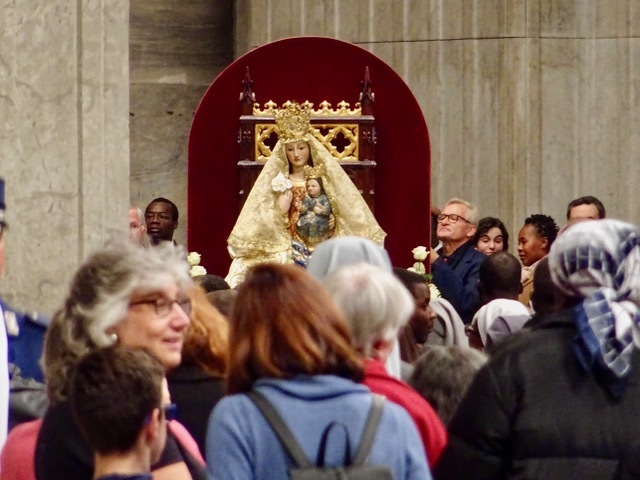 When I zoom way in we see a statue of the Madonna which is part of this special mass. Bob thought he saw someone in white below the statue. Take a look at the link above. He is sure he saw the Pope. 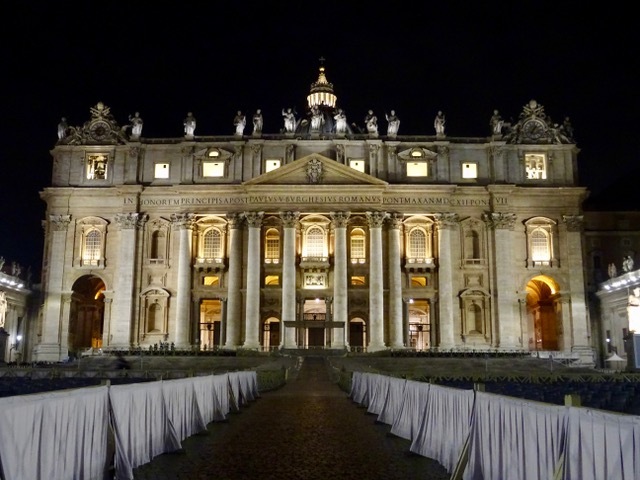 This photo shows the many rows of chairs that line the piazza in front of St. Peter’s for the Papal Audience that is held on Wednesdays. As we walk further away we are able to see the dome on top of the cathedral. 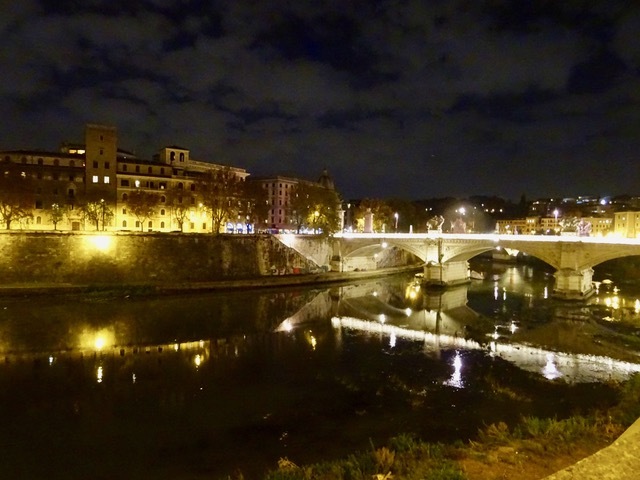 It is a bit of a walk to the metro but it is a nice night and there is lots to see along the way. 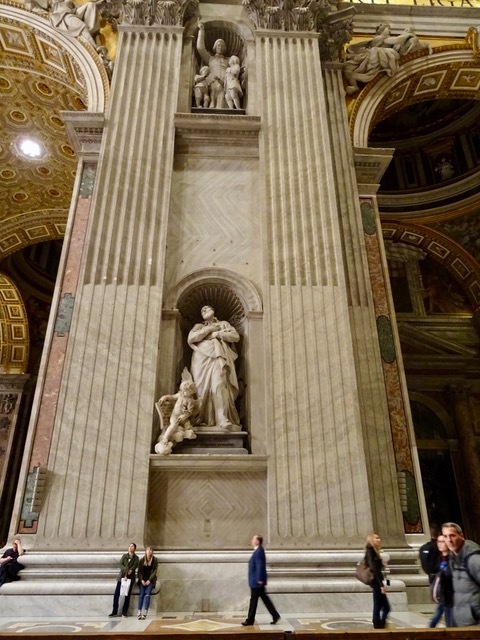 This entry was posted in Cathedrals, Churches, Historic Buildings, Italian Cathedrals, Italian towns, Italy, Rome, Sculptures, The Vatican, Vacation and tagged Cathedrals, Churches, Italian towns, Italy, Peace for South Sudan and Congo, Pope Francis, Rome, St. Peter's Basilica, The Vatican by Trudy. Bookmark the permalink. Hi Trudy and Bob, I had to do a lot of catching up reading all your amazing blogs, because I didn’t take my phone along to Mexico. Bob I’m so sorry to hear about your Mom, even with an age of 93 it is hard to say goodbye. 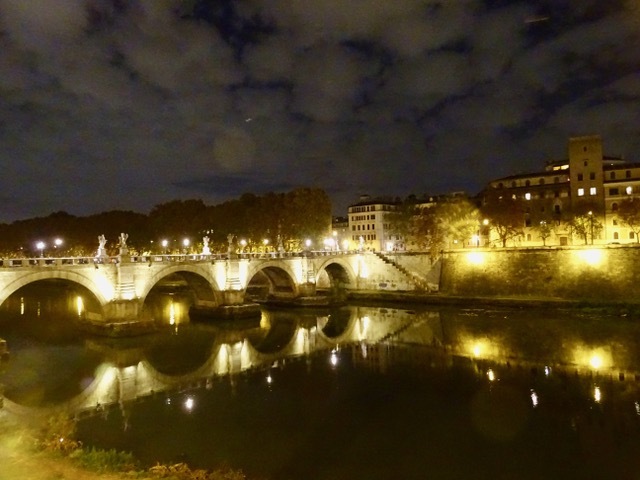 In my memories and thoughts I travel with you again through Italy. Hi Franziska, Thank you for your condolences. I hope you had a great time in Mexico and so glad you are enjoying ‘traveling’ with us. Great pics! It was under scaffold when I was there. They’re getting a foot of snow on the big island in Hawaii!!! So glad there isn’t any scaffolding. that would be bit disappointing. A foot of snow in Hawaii! and some people still think there is no climate change going on? Beautiful🤗you never disappoint! Always a visual treat & educational too. Just returned from the library where there was a presentation on Paris & also Camino de Santiago. Aww, thanks Gayle. Presentations are a great way to see places when it isn’t possible to travel yourself.